Hereditary Cancer Testing: A beginning for prevention and cure ! Hereditary cancer testing is a powerful tool when it comes to preventing, diagnosing, and treating a wide assortment of cancers. Today, there are many different types of genetic tests available. Oftentimes, doctors recommend hereditary cancer testing if you're concerned about a history of cancer in your family, have had cancer in the past, or have other risk factors that may leave you vulnerable to developing certain types of cancer. Many types of cancer happen suddenly, without warning and despite not having a family history of cancer. However, certain types of cancer grow from hereditary DNA changes present in your body from birth. Sometimes, these changes increase your chances of developing cancer later in life, and hereditary cancer testing can detect certain genes related to common hereditary cancers. 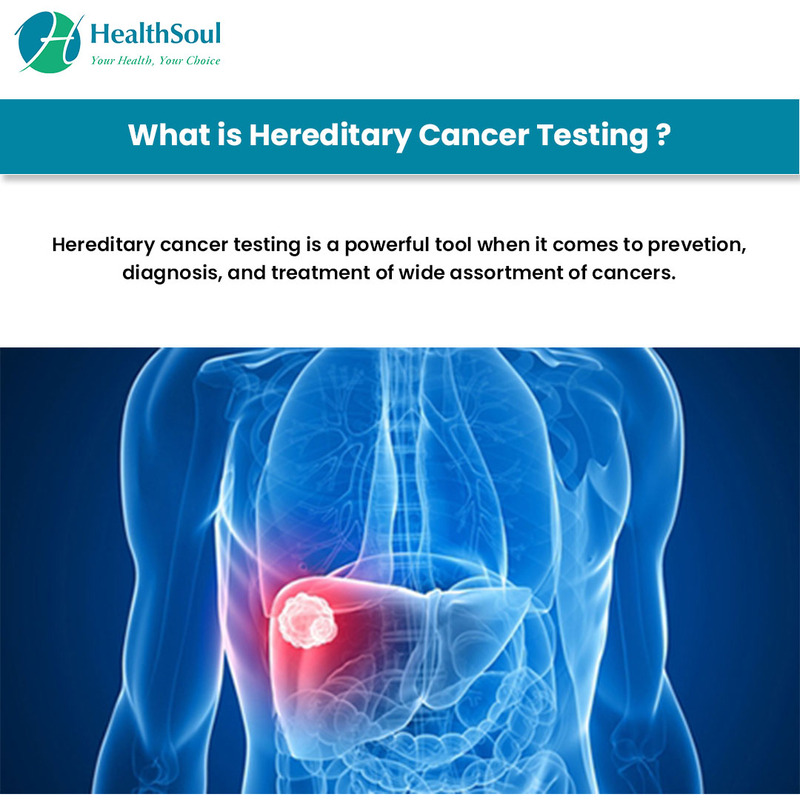 The overall goal of hereditary cancer testing is to determine your cancer risk. If your doctor determines you have an increased risk of developing cancer, he or she may also order tests to diagnose your condition, such as a colonoscopy, a mammogram, or a CT scan. Once your doctor determines your risk or diagnoses you with cancer, he or she can make the proper recommendations about preventative care or treatment options. Who Should Undergo Hereditary Cancer Testing? It's important to note that hereditary cancer testing is usually reserved for patients with a high risk of developing cancer. For example, if you're female and your mother and grandmother developed breast cancer before the age of 50, you qualify for hereditary cancer testing. Additionally, if your mother or father had a rare form of cancer at a young age, your doctor may recommend hereditary cancer testing. Each one of these conditions results from genetic changes that may increase your cancer risk. Because they're hereditary, some people are at greater risk than others for developing certain cancers. It's important to note that there is no test that will definitively tell you whether you're going to develop cancer. Even if you have a 75 percent chance of developing breast or ovarian cancer, you may never actually develop the disease. Similarly, if you have a small 10 percent chance of developing cancer, you may one day develop cancer. That's how cancer is. It's totally random and unpredictable, but with tools like hereditary cancer testing, you can better prepare yourself for the unexpected.